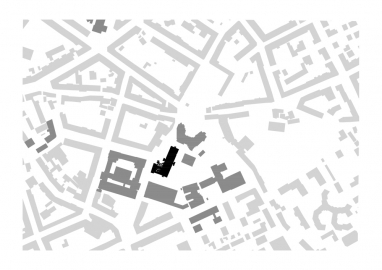 Revitalization and conversion of the listed post-war modernist laboratory faculty building with „low-tech by high knowledge“ into a modern research facility of the Faculty of Computer Science and Biomedical Engineering of the Graz University of Technology. The adaptation and revitalisation of the listed laboratory building into a Biomedical Engineering Centre is a very interesting challenge. 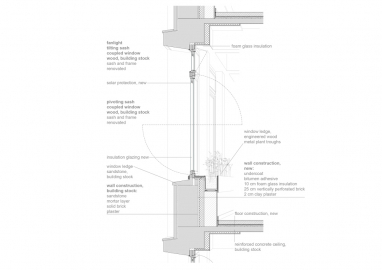 Issues of protection of historic building substance, energy efficiency, functionality, economy in construction and operation have to be combined into an overall concept. 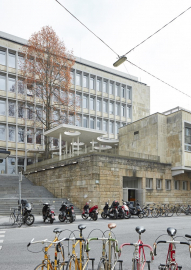 The focus thereby is the exposure and the optimal utilisation of the building’s existing structural potential designed by the Styrian Architect Karl Raimund Lorenz in the mid 1950ies. 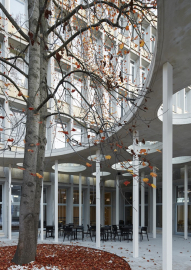 This post-war, strictly functional modern architecture has been adapted and reused, on the one hand, as office and research building and turned, on the other hand, into a central hub for the university campus site. 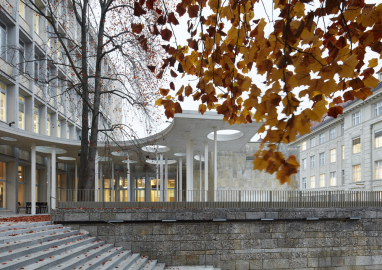 It is an example for a contemporary approach to convert post-war modern architecture by simply exploiting its core character and working with the existing architecture. The façade remained mainly untouched – as required by the authority for monument conservation. But within the building everything, except the main supporting structure and staircases, was demolished. The layout of all existing floors was completely altered from a strict centre corridor development into an open plan office and study zone. The only new elements perceived from the outside are the strikingly shaped canopy on the ground floor and the added top floor replacing the former technical floor. One of the main characters of this representative architecture from the 1950ies is the differentiation in use of the ground floor, upper floors and top floor. This distinction remains with the building’s reuse. 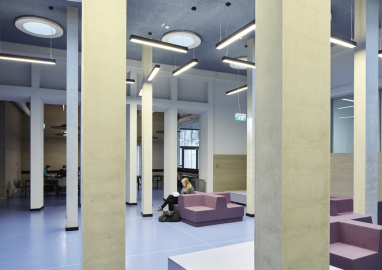 The ground floor retained its function as main entrance but was converted into the representative public campus centre with a library, study areas, café and lecture rooms. 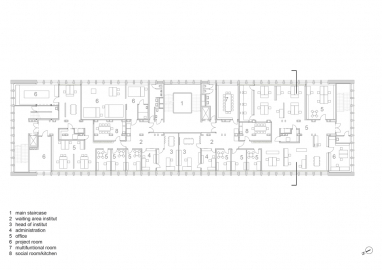 All upper floors were maintained as office and research zones. 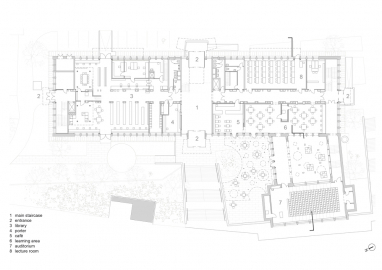 The added top floor recreates the shape of the former technical floor but with a completely altered use. It is now a restaurant open to the public allowing every visitor to enjoy a 360° view over the city. Central to the renovation, despite the functional adaptation, was the energy-saving refurbishment of the existing structure. Since the façade had to remain mainly untouched (besides the window renovation), new layers of insulation and storage mass were added on the inside. Additionally, the newly installed underfloor heating system is used as component activation. As a result of these measures the energy consumption was nearly cut in half from 160W/m² to 85W/m². 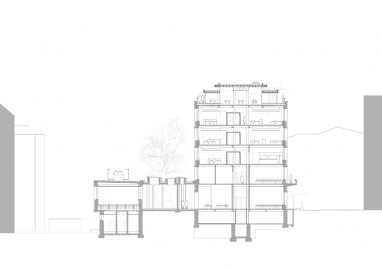 The main principle was to uncover and highlight the existing concrete structure as one main modernist architectural characteristic of the building. 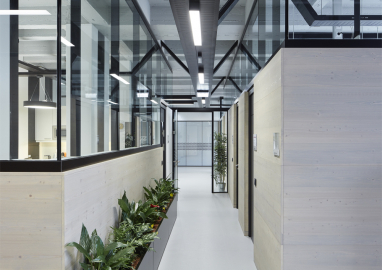 Every additional element to the existing raw concrete structure was designed to be detached from these main existing structural elements – be it the office boxes or the acoustic elements and the ladder rack cable system under the ceiling. Every new non-structural component and surface is selected by its potential for an optimal atmospheric environment and energy-efficiency (regarding the design, haptic, acoustic and climatic features). The material selection combined with the preserved building structure turn into an integral design concept.